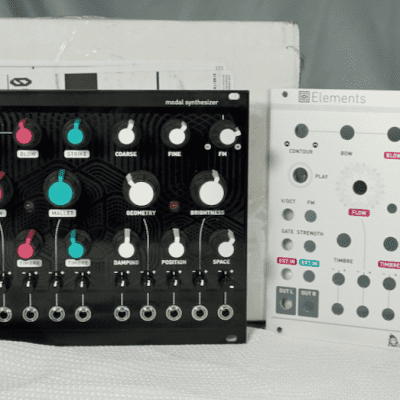 Elements is a full-blown synthesis voice based on modal synthesis - an under-appreciated flavour of physical modelling synthesis with a strange and abstract feel. 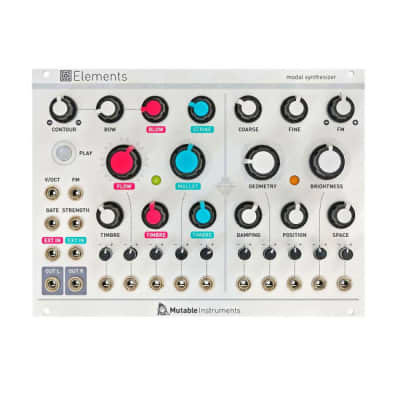 Elements combines an exciter synthesis section, generating raw, noisy sounds characteristic of bowing (filtered friction noise), blowing (pitch-controlled granular noise), or striking (stick, mallet, hammer or brush sample playback... or bursts of synthetic impulsions). 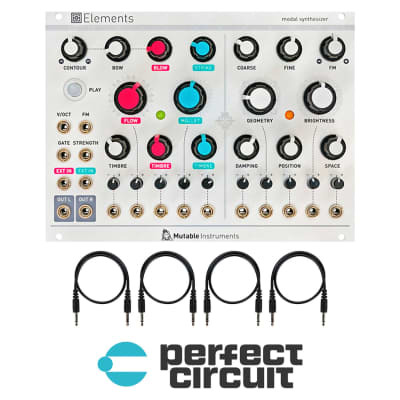 These sources, or external audio signals, are processed by a modal filter bank - an ensemble of 64 tuned band-pass filters simulating the response of various resonant structures (plates, strings, tubes...) with adjustable brightness and dampening. A stereo ambiance reverberator adds depth and presence to the sound. All parameters have a very meaningful and well-delimited impact on the sound. 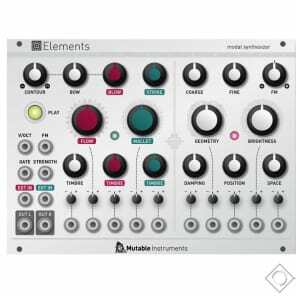 When designing Elements, a great care has been taken in selecting parameter ranges and control curves producing a large palette of sounds - often beyond physical realism - but always well controlled and stable. The "dark spots" of noise and feedback are reached gradually, and they do still react to controls. 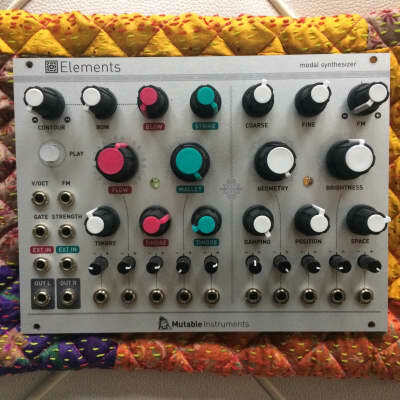 The module is deliberately menu- and switch-free - what you dial/patch is what you hear! 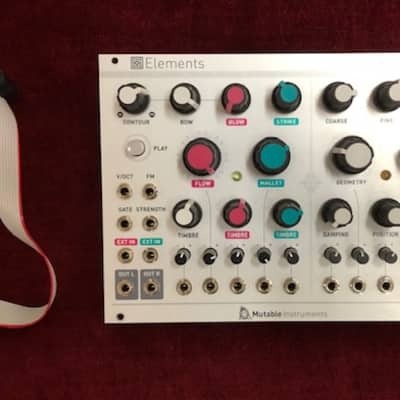 Percussive impulse generator: interpolates through a collection of impulsive excitations – including sampled sticks, brushes and hammers, and models of damped mallets, plectrums, or bouncy particles. 2-pole low-pass filter and pitch control. Internally uses 64 zero-delay state variable filters. Brightness. Specifies the character of the material the resonating structure is made of – from wood to glass, from nylon to steel. Damping. Adds damping to the sound – simulates a “wet” material or the muting of the vibrations. Audio acquisition and restitution: 16-bit, 32kHz.